This minor Mankiewicz post War classic sets up a bit of a contrived situation, three wives/friends who receive a letter from a mutual friend stating that she has run away with one of their husbands, but without telling them who. And while the narrative plays out the scenario of each of the women rethinking the state of their marriages with predictable conventiality, a surprisingly smart examination of marriage, fidelity and career expectations of women in the burgeoning feminist age emerges. Deborah Bishop (Crain), Lora Mae Hollingsway (Darnell) and Rita Phipps (Sothern) are three friends en route to a weekender upstate vacation. Upon boarding a ferry they are given a letter from a former friend Addie Ross claiming to have run away with one of their husbands. Who could it be? Does each one feel confident in the loyalty and fidelity of their husbands? The three ladies refuse to give into this shameful and anonymous ultimatum, and wait to discover who it is when they return home. Their vacation continues but clearly eating away the mind and spirit of each of the ladies. It’s a delicious tease to this unique concept. Throughout the two day boat trip each of the wives’ minds wander back to a key moment of their relationship which might point to their husband’s desire to flirt with infidelity. For Deborah, a girl who always felt an outsider to the old boys club of their affluent small town, she remembers her first introduction to her husband’s friends and the pressure to live up to their country club expectations. For Rita, she recalls an argument with her husband (played by then supporting-player Kirk Douglas) over her career aspirations as a writer of throwaway radio scripts. For Lora May, her anxiety stems from the perceived marriage of convenience between her and her husband whom she thinks is just a gold digger. The trajectory of the film becomes becomes transparent quickly during the first flashback to Deborah’s memory. We know the film will tease us with evidence suspecting each of their husbands. Vera Caspary’s script, based on a Cosmo magazine article, is not subtle in this respective. And so there’s an expectation it will simply result in a sort-of whodunit mystery to be solved. But Ms. Caspary’s script crafts some surprisingly weighted dialogue exchanges giving culpability to both the wives and the men – the kind of intellectual banter we would see in works of someone like Tennessee Williams. Thus the film becomes less about whose husband cheats than the continuing difficulties faced by women in love and life. 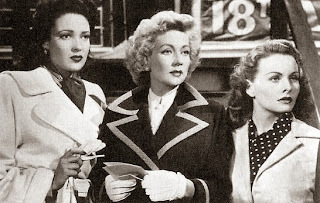 And coming from a post-War perspective, Mankiewicz admirably foreshadows the progressive attitude of women in the workplace and challenges the traditional notions of domestic responsibilities.